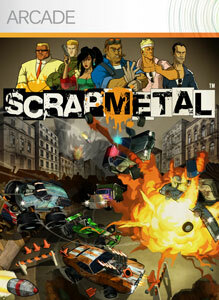 Scrap Metal is the second arcade for the Xbox LIVE Block Party and is from Slick Entertainment Inc., the creators of N+, and is an arcade style racing game with some weapons to give you an edge in races. "Drift around corners with guns blazing and take out legendary competitors in this fast-paced, top-down racing game. Fight your way through explosive, action-packed missions and defeat cunning bosses to add their vehicles to your garage. Customize your newly-acquired cars and then return to the track to blast through more enemies. Jump online with Xbox LIVE to race against your friends and crush their cars with the wheels of your monster truck in pulse-pounding online multiplayer matches."